On Thursday April 22, 2010, Georgia’s WIN List celebrated our 10th Anniversary by honoring the former first lady of the United States, Rosalynn Carter, with our “WINining Woman” award. It was such a special evening and could not have been possible without your support. Thank YOU. To view pictures from the event, click here. Please see our tribute video below. Featured guests include WIN List-endorsed elected officials. 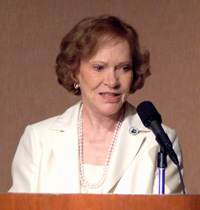 2010 “WINning Woman Award” presented to Rosalynn Carter. Event seating is limited and early confirmation is encouraged. Please join us to: raise funds to elect highly qualified Democratic women in Georgia, recognize the accomplishments of outstanding women in leadership, and inspire more women to run for public office and WIN!